The wet-season is a time of lush green landscapes, epic sunsets and Hollywood quality lightning shows! Although a wet-season tour may not be no. 1 on everyone’s bucket list we have found many people who visit during the dry-season often seek to come back and experience the other side of the coin. Depending on who you ask the wet-season starts in October or November and runs all the way up until the end of April. The beginning of ‘the wet’ is a time we call the ‘build-up’ and it’s a time where the Top End is at its hottest as we wait for the onset of the monsoonal rains. This is the ‘silly season’ a time when people are known to go a little ‘troppo’ as the Gods tease us with cooling rains but not a lot eventuates. It does get a little sweaty at this time and multiple showers (the bathroom type) are not an uncommon occurrence. It’s also a time where a cold beer before mid-day is socially acceptable! January to March is then when the majority of the rain falls, roughly around 350mm per month in Darwin. Next we head into April and rain become less frequent then by the 1st of May ‘the dry’ officially starts. 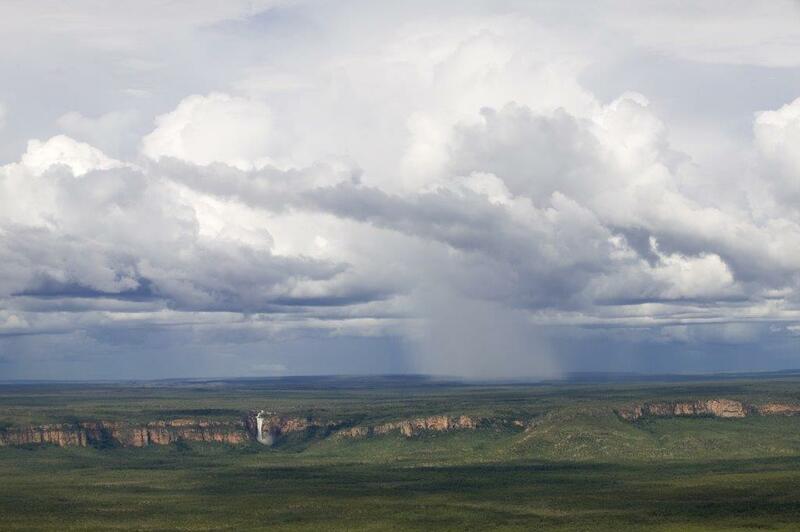 Over the duration of the wet-season around 95% of our yearly rain falls, an average of about 1.7 meters! Your experience of the wet-season really depends on when you visit. There are plenty of touring options throughout this time and for those willing to put up with a bit of heat and humidity the wet-season offers a lot. Spectacular thunder and lightning storms are one of the big draw cards. It’s quite something to see Mother Nature in all its fury (and from the comfort of somewhere dry, perhaps with a glass of wine in hand!). During the wet-season Venture North only operates tailor-made private charter tours, each designed specifically for the individual or group. At this time of year we love to tour Kakadu as well as Litchfield National Park and Katherine Gorge (Nitmiluk National Park). All of these destinations offer very different and often more spectacular sites than in the dry-season. The other great thing is you usually don’t have to share these places with loads of other tourists. You have to remember too that when it rains it’s not like down south where it gets cold. It’s always warm during the wet but the rain (often just a passing shower) cools the land and entices you to continue to explore. With the rain the billabongs, rivers, creeks and floodplains swell and the waterfalls begin pumping. There is no better time for a scenic flight tour over Kakadu or Litchfield than at this time of year. With the change of season many wet-season sites come alive. Waterfalls that do not exist during the dry pop up and stagnant waterholes become perfect for swimming once again. The Yurmikmik Walks in Kakadu should be on every tour itinerary as both Boulder Creek and Motorcar Falls offer great hiking and swimming opportunities. Moline Rockhole is another good swimming option in Kakadu and if you’re interested in rock art then you can still access Nourlangie and Ubirr. As the rivers rise the road to Ubirr eventually becomes impassable which then allows you to catch a boat to the site through the flooded Magela Creek, very cool! During the wet you can still do tours through Katherine Gorge (Nitmiluk) but most other activities around here cease. Litchfield though still offers a range of options including various swimming sites, the termite mounds and waterfalls. The nearby Territory Wildlife Park also operates year round. The wet-season may induce some negative connotations for some but for the intrepid traveller that does visit they are never disappointed. So why not save a few dollars (it’s much cheaper to travel here at this time of year) and give the wet-season a crack!